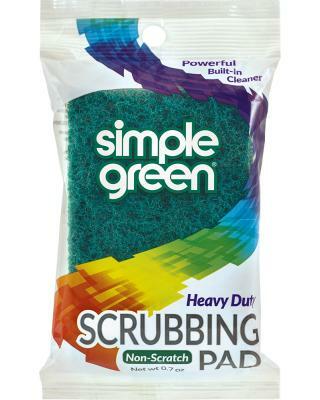 Simple Green® Scrubbing Pads are convenient cleaning tools packed full of Simple Green® All-Purpose Cleaner. The non-abrasive scrubbing pad safely removes dirt, food, oil and other grime throughout your home. Just wet with water and squeeze to activate the non-toxic and biodegradable cleaning solution. The durable scrubber is made from 100% recycled polyester. They utilize a safer, non-hazardous cleaning solution, which does not require gloves or other PPE, making them ideal for use in a number of industries. The non-corrosive solution is ideal for cleaning vehicles, machinery, tools and equipment. The non-abrasive pads are safe for delicate surfaces including tile, stone, porcelain, painted surfaces, sealed wood and fiberglass. The pads are compact and light weight. They also last for multiple applications, making them ideal for use in the field. Pads are made from 100% recycled polyester.